On June 4th, the Lower Mainland Sheep Growers Association had their annual fleece sale. It was pretty exciting for us fibre junkies because this sale hasn’t taken place for about three years. On the Wednesday before the sale, growers brought their fleeces for sifting. That’s when a group of dedicated volunteers and fibre experts look over each and every fleece and sort them. In sorting them they are graded so the person buying the fleece knows, to some extent what they are purchasing. The sale was a great event. In addition to being able to buy raw fleece, there were vendors selling prepared fibres and other spinning, knitting and weaving accoutrements; food and information; and lots of people demonstrating their crafts. It was like a mini-fibre festival. Best of all, after days and days of rain and grey skies, the SUN came out. 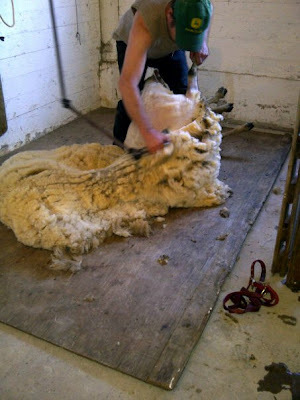 At various times throughout the day, there were shearing demonstrations. This is Ann Embra’s ewe being sheared. She didn’t want to be shorn at first, but she eventually gave into it. The shearer is a Master Shearer — didn’t catch his name — but he really knows what he’s doing. Not a single nick on the animal, a wonderful fully in tack fleece, and no trauma. She won’t be afraid of being shorn next time. All during the morning the fleeces were being judged. Shortly after noon the prizes were awarded. There was a Grand prize ($100) Reserve prize ($75 – sort of like a second prize) and Spinner’s Choice Award ($50). At 1pm the fleeces went up for sale. There was a bit of a “rush” for the wonderful ones, but afterwards, things slowed down and you could linger and look and make your decision in good time. My friend Debbie and I decided to split a fleece. I need more local fibre like I need . . .. you know the rest. But I couldn’t resist. We looked around and were mightily tempted by the Blue Face Leicester fleeces that were there — but at $15lb for a 7lb fleece, we decided to take a pass. No complaints about the cost, famer’s deserve whatever they can get for the fleeces. But 7lbs of fleece with an 8inch staple, just said “work”. Lot’s of work. So we decided to split a 6lb Dorset fleece Lovely soft, with a 4 – 5in staple. My take was 3lbs. Brought it home and scoured it. Weighed it again when it was clean and dry — 2lbs!! Go figure. I guess the lanolin and dirt weighted more than imagined. Also, the lanolin traps a lot of moisture into the fibre, again adding to the weight. I’ll post more photos of that fibre — and the dyeing I’ve done with it. This entry was posted in fleece sale, local fibre on June 18, 2011 by DianaTwiss.